You know the old saying, "the shoes make the outfit!". That holds true even for the littles. Today I'm sharing our tricks to get more wear out of those Holiday looks with Nordstrom. I think I've mentioned before that my little Drew would wear a tutu every day if she could! The girl knows what she likes!! So when it comes time for finding her a dress/outfit for the Holidays, I always look for something that I know she'll enjoy wearing after the Holidays as well. Nordstrom Kids is the best! Not only can I find her unique pieces, but the quality and fit is right. As soon as we saw this sparkle Tutu Dress we knew it would be perfect. The floral pullover is not attached so it can be worn later with leggings, jeans, or another skirt. And the tulle skirt has an attached tank so by layering another sweater, top, or tee over it, you have a completely different look. But for the Holidays, we love it paired together! A little dressy, a little casual! Kid-perfect! By changing the shoes you pair with it, this dress (or really any dress!) will work for a variety of occasions. When it comes to shoes, Nordstrom has the best selection for kids! Just like the women's shoe department (that we all love), the kids shoe selection is huge! The best part is the free shipping and free returns! So if you are unsure of sizing, order 2. Find the best fit, then send the other back. 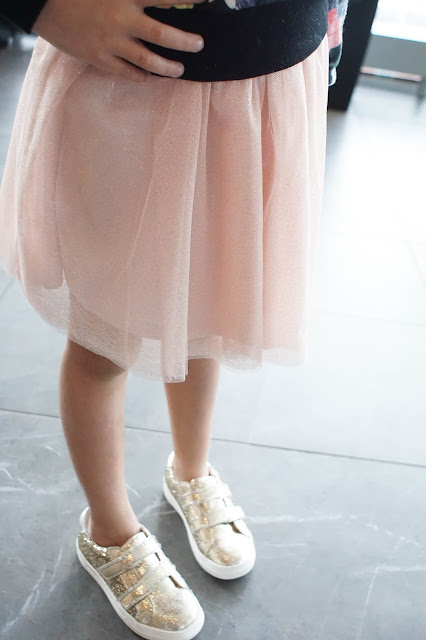 Her favorite look by far, were these classic Scallop Ballet Flats, older girl style here. She's a little ballerina/singer at heart. These booties are one of her favorites for going to Pre-school. A sneaker and bootie combined! They look adorable with leggings and dresses but help to give this dress a more casual, every-day look. Plus they are perfect for the cooler weather! Who can say no to a glittery sneaker!? Not this little girl!! This shoe is perfect for those casual family dinners out. These sneakers are currently on sale and come in 5 colors. Once again, it's a little fancy with total comfort! Looking for more Holiday inspiration? 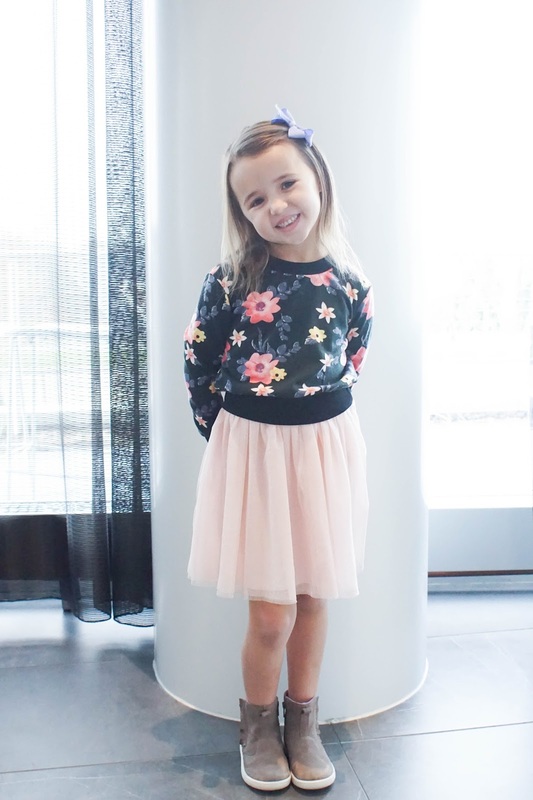 I've rounded up more adorable kids pieces that are perfect for the Holidays (and after!). Click the items below to get more details. A big Thank You to Nordstrom for sponsoring this post. As always, all thoughts and opinions are my own.